Pop Evil debuted the video for its latest single this week. The band premiered the video for its new single ‘Be Legendary‘ on Thursday. The video follows childhood versions of the band’s members as they face a pair of bullies who took every chance to make the then young friends miserable. Eventually the group stands up to the bullies before the video flashes forward to the band looking back on the site of that face-off as the song ends. Directed by Columbia Tatone, who also directed the band’s videos for ‘A Crime to Remember,’ ‘Colors Bleed‘ and ‘Waking Lions,’ the video illustrates the song’s lyrical theme, which he discussed in a recent interview. Pop evil front man Leigh Kakaty expanded on Tatone’s comments. ‘Be Legendary’ is taken from the band’s self-titled 2018 album, which was released via Entertainment One. Pop Evil just wrapped the North American leg of its tour in support of the album with veteran comedian Don Jamieson..
With the North American leg of its tour done, the band will head to Europe next week for a 10-date run there. From there, the band will take a month off to rest and recharge before heading down under for a series of dates across Australia from Apr. 4 to Apr. 7. Once the band winds down its European and Australian runs, it will return to the U.S. for another run from Apr. 10-20. The band’s current schedule is noted below. Pop Evil has released more new music from its latest album. The band debuted the video for its latest single ‘A Crime To Remember‘ this week. Directed by Columbia Tatone, the video is meant to illustrate the song’s message of the importance of unity. Front man Leigh Kakaty explained in a recent interview, saying the world needs to come together, adding that Tatone’s treatment did an exceptional job of delivering that message. 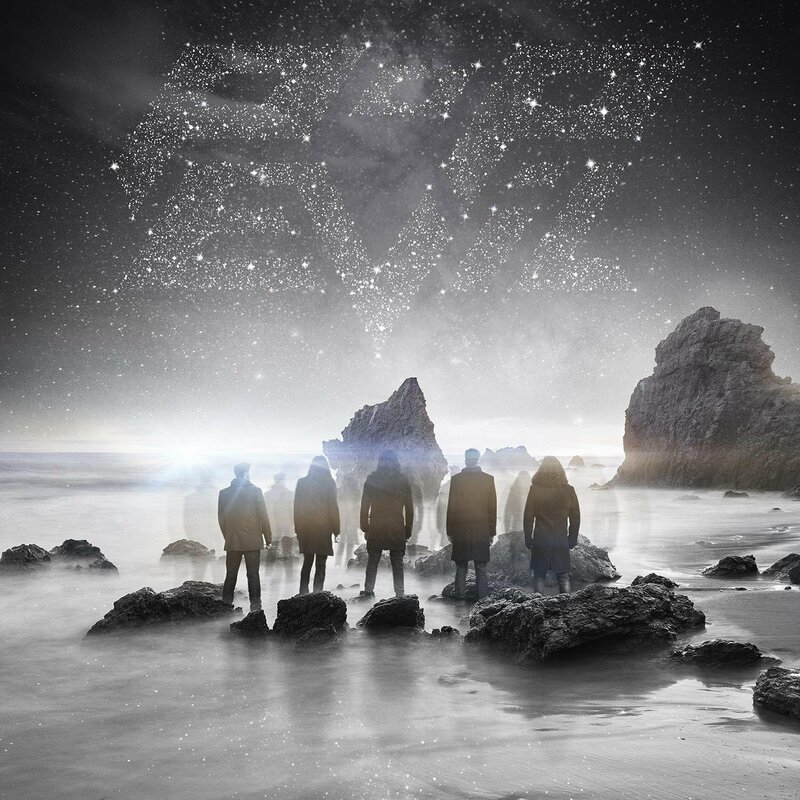 ‘A Crime To Remember‘ is the third single to be released from Pop Evil’s recently released self-titled album. ‘Waking Lions‘ and ‘Colors Bleed‘ are the album’s other two current singles. Otherwise is preparing to hit the road this weekend for a series of live dates in support of its latest full-length studio recording Sleeping Lions. The band’s third album, it is scheduled to be released Sept. 22 in stores and online, and continues the success brought through the band’s first two albums – True Love Never Dies (2012) and Peace At All Costs (2014). That is due in part to the mix of musical influences evident throughout the record. The record’s collective lyrical content plays its own integral part in its overall presentation, too. Its sequencing rounds out its most important elements. When it is joined with the record’s musical arrangements and lyrical content, the whole of the noted elements makes it deserving of a spot on any critic’s list of the year’s top new hard rock albums. 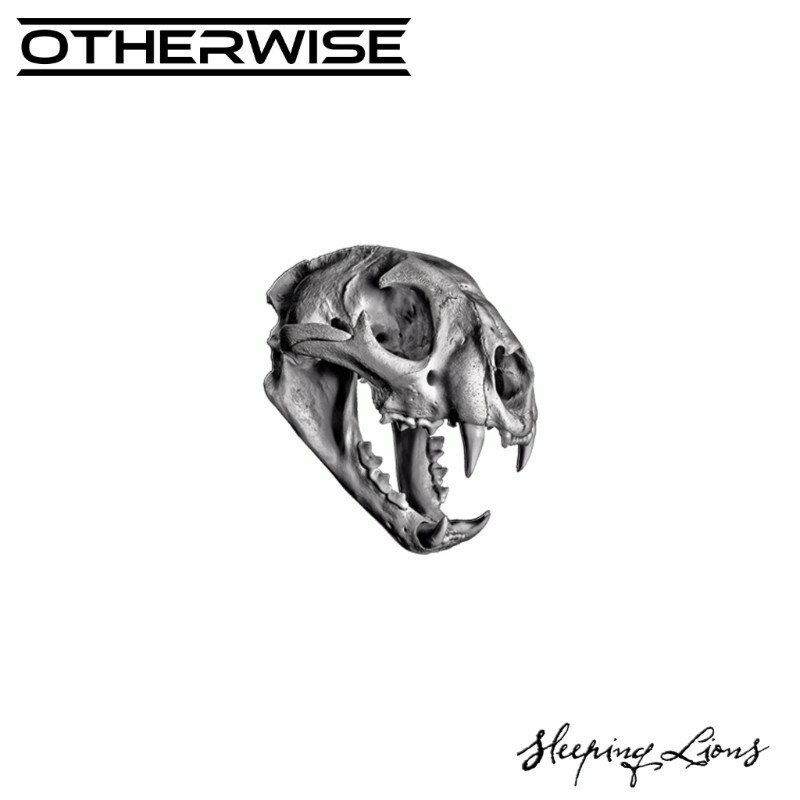 Otherwise’s third full-length studio recording Sleeping Lions is a record that is deserving of a spot on any critic’s list of the year’s top new hard rock albums. That is due in part to the musical arrangements presented over the course of the record’s 11-song, 44-minute run. Right from the album’s outset, listeners are treated to a heavy, guitar-driven arrangement in ‘Angry Heart’ that lends itself easily to comparisons to so many songs from Alter Bridge. The arrangement presented in the record’s title track, which comes early in the album’s run, changes things up instantly, conjuring thoughts of Shinedown. Much the same can be said of the melodic hard rock arrangement presented in ‘Crocodile Tears.’ ‘Suffer,’ the album’s third track, changes things up just as much, leading to thoughts of Staind with its arrangement. That is due both to the song’s arrangement and front man Adrian Patrick’s vocal delivery style here. One could even compare the arrangement presented in ‘Close To The Gods’ to compositions from a handful of well-known hard rock acts including Soil, Drowning Pool, Sevendust and other similar acts. These comparisons are just some of the ways in which the album’s musical arrangements prove so important to its presentation. They show the album’s musical reach for all intents and purposes, which is clearly rather extensive. Considering this, that reach builds a solid foundation for Sleeping Lions. It is only one of the album’s key elements, too. The album’s overall lyrical content is just as important to discuss as its musical arrangements. 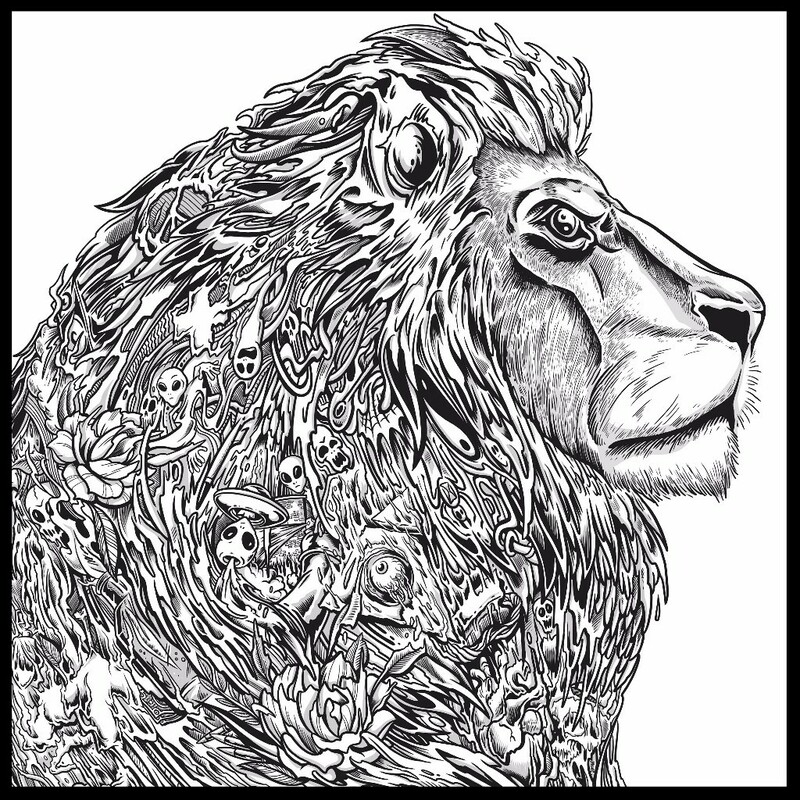 The lyrical content presented throughout the course of Sleeping Lions is important to discuss because it is just as varied as the album’s musical arrangement. Case in point is the lyrical content presented in the album’s closer, ‘Bloodline Lullaby.’ The song’s lyrical content comes across perhaps as Patrick (or one of his band mates) singing to a child before heading out on the road as he sings in the song’s lead verse, “Never worry child/Everything’s alright/It may take a while to see the good light/I’m right here with you/Always true/So don’t say goodbye/I’ll see you soon/Another day/Another moon.” The song’s second verse lends itself just as much to that thought as Patrick sings, “Crazy as it seems/Life in the spotlight/Chasing down a dream/Living through a phone line/You are all I need/You’re my everything/Counting down the hours/Oh how the time flies/Running the miracle mile/Crossing the state line/I’m right here with you/Always true/So don’t say goodbye/I’ll see you soon/Another day/Another moon.” It’s hardly the first time that a musician or act has ever crafted a song about life on the road and the strains connected therein. But the lyrical approach taken here makes it original. The addition of the heartfelt musical arrangement, which itself can be compared to compositions from so many of Otherwise’s current counterparts, adds to that emotional impact. Considering this, the song becomes just one clear example of why the album’s lyrical content is just as important to its presentation as its musical arrangements. The lyrical content presented in ‘Nothing To Me’ is another example of what makes this album’s lyrical content so important to discuss. While the album’s closer presents a moving message of familial love in its lyrical content, ‘Nothing To Me’ is the polar opposite. It is clearly a song about a broken relationship, but is certainly not the standard oh-woe-is-me message. Rather, it presents a very self-confident tone in its wording as is evidenced right off the bat as Patrick sings, “So this is what you have been waiting for/Just to be uglier than me/I’m not a line in the sand/You sin has been wasted/And you’ve become the very thing that you hated/Careful/You might find what you’re looking for.” That confidence continues in the song’s second verse as Patrick sings, “Yeah, you should focus on yourself/To pretend you’re not scared/I can tell that you’re shakin’/Don’t look down/Your safety net’s breakin’/Careful/You might find what you’re looking for.” There is plenty of fiery energy behind these words thanks to Patrick’s delivery. That fire and the message in the lyrics makes fully evident the message here. As with ‘Bloodline Lullaby,’ it is not the first song of its style. Other proud, confident breakup songs have been crafted by other bands, but the lyrical fashion in which that message was delivered here makes the message just as powerful and welcome as ever. With that in mind, it makes the song yet another example of why the album’s lyrical content is so important to its overall presentation. It still is not the last example of what makes the album’s lyrical content so important to discuss. ‘Close To The Gods’ is yet one more example of what makes the album’s lyrical content so important to discuss. The content presented in ‘Close To The Gods’ is another prime example of what makes Sleeping Lions’ lyrical content so important to discuss because it comes across as one of the record’s deepest songs, lyrically speaking. Patrick sings in the song’s lead verse, “Are you willing to do/What it takes to be truthful/Can you cut through the filth/And get down to the beautiful” before singing in the song’s lead chorus, “Now I’m crawling on a face of stone/I’m trying hard to leave a mark/So reckless on a path unknown/Hoping to catch a spark/Getting close to the gods/And the devil is falling/Now there’s no way to stop/No escape from the calling/So you don’t fall behind/We’re holding the line/Fighting for life as we climb/Close to the gods/All the temples are falling/Getting close to the gods.” Additionally, he sings in the song’s second verse, “Feel the energy slip/Through your hands as you witness/All the steel turn to rust/We are sand/We are ashes and dust.” The message that is seemingly delivered here perhaps addresses people’s striving to be better than they are, trying to escape all of the world’s negativity and evil. That is of course just this critic’s interpretation. It would be interesting to find out what exactly Patrick is saying with the words presented here. That depth in the song’s lyrical content shows once more why Sleeping Lions’ lyrical content is so important to the album’s overall presentation. It most certainly is not the last example of what makes the album’s lyrical content so important. The seemingly uplifting message in ‘Weapons,’ the hard-hitting commentary in the album’s title track and the contemplative reflection of ‘Angry Heart’ each present their own interesting thoughts. Taking this into consideration along with the lyrical content not noted here, it should be clear why Sleeping Lions’ lyrical content is just as important to its overall presentation as its musical arrangements. That collective content is not the last of the album’s most important elements. Its overall sequencing rounds out its most important elements. Sleeping Lions’ sequencing is just as important to discuss in analyzing the album as its musical and lyrical content because it of the time and thought that was clearly put into this part of the record’s presentation. The album opens with full, fiery energy in its first two songs before presenting a slightly more reserved arrangement in ‘Suffer’ that still boasts its own energy. The album’s energy and mood are relatively well-balanced from start to end. For the most part, the album’s energy is maintained throughout the record even as the songs’ moods change from one work to the next. Even as the album reaches its finale, the energy barely lets up. The song’s verses are quite reserved, but the choruses are just as powerful as any of the album’s other compositions. Considering this, it becomes clear why the album’s sequencing so easily ensures its listeners’ maintained engagement throughout the record. Its energy never goes too far one way or another at any point throughout. Rather it is just right from start to finish. Keeping that in mind, it should be obvious by now why the album’s sequencing is just as important to its presentation as its musical arrangements and lyrical content. The whole of those three elements together makes Sleeping Lions a work that continues Otherwise’s previous successes and is, again, deserving of a spot on any critic’s list of the year’s top new hard rock albums. Daybreak Embrace is on the verge of being embraced by the masses thanks to its new video. The Florida-based rock outfit released the video for its latest single ‘The Moment’ earlier this month. According to the description on the band’s CD Baby website, the song is meant to be “a tribute to the fans and family gained on a cross-continent journey full of love, life and loud music. The video sets the song against footage of the band performing at Woodstock Poland 2016. For those unfamiliar with the currently unsigned act, the song conjures thoughts of Shinedown, Pop Evil, Five Finger Death Punch and others of that ilk. The video is streaming online now here. Pop Evil is back on the road again. The band hit the road Tuesday for the “Rock ‘N’ Roll Now Tour: Right Now.” The Tour is in support of the band’s latest full-length studio recording Up. The tour launched in Louisville, KY and will see the band perform in Charlotte, NC tonight. It wraps Feb. 26 in Sault Ste Marie, MI. 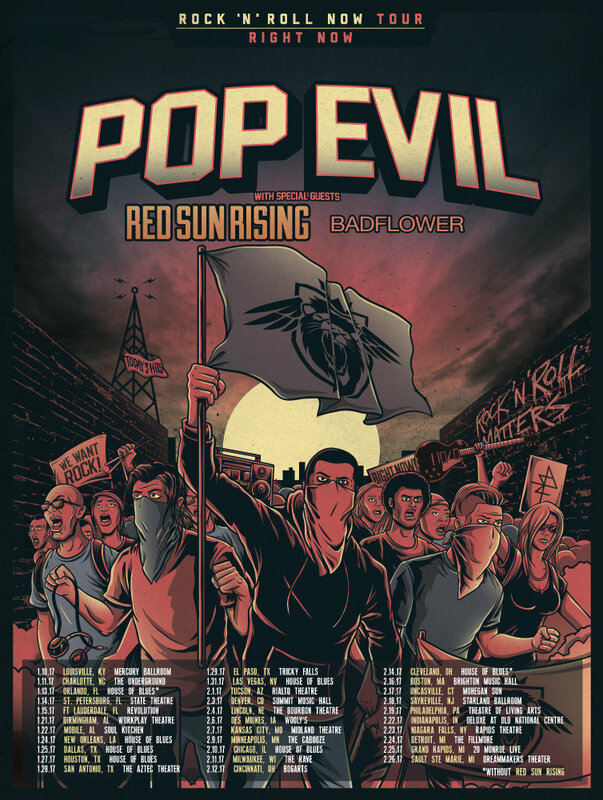 Red Sun Rising and Bad Flower are serving as support acts throughout the tour. Along with its tour, the band also recently debuted its latest single ‘If Only For Now’ on radio stations nationwide. The song is the last single to be released from Up. Audiences can hear the song now here. Pop Evil released Up in 2015. The album debuted at #1 on Billboard’s Indie Chart. It landed at #25 on the magazine’s Top 200 albums chart, #16 overall and #3 on the magazine’s Top Hard Music Albums Chart. Romantic Rebel is headed back out on the road. The band announced Monday that it will join Smile Empty Soul on the road this summer for the band’s “Shapeshifter Tour 2016.” The tour launches this Friday, July 15th in St. Louis, MO. It will share time on stage as support for Smile Empty Soul alongside The Everyday Losers, Shallow Side, and Beitthemeans on the tour. 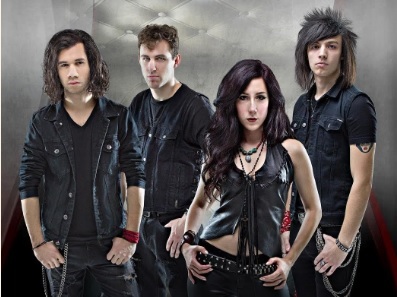 Romantic Rebel’s upcoming live dates are in support of its upcoming EP Begin Again. The band announced Monday that fans who come out to its live shows will be able to pick up Begin Again before its official release date, which has not yet been announced. To keep up with the latest sports and entertainment news and reviews go online to http://www.facebook.com/philspicks and “Like” it. Fans can always keep up with the latest sports and entertainment news and reviews in the Phil’s Picks blog at https://philspicks.wordpress.com.